This is a staff. It has 5 lines and 4 spaces. The lines are E G B D F (the first letter of this phase “Every Good Boy Does Fine). Note that the notes used on both staves are whole notes. Here’s what you have learned from this lesson: A staff has 5 lines and 4 spaces. The names of the lines are E G B D F and the names of the spaces are F A C E. The notes used on both staves are whole notes. Find a music book or sheet music and name the nine notes that we have discussed today. They will not be in the same order because they form a melody, but . . . name them anyway! Name only the notes we have discussed! Lesson 2 introduces the bass clef. The bass clef sign looks like this. 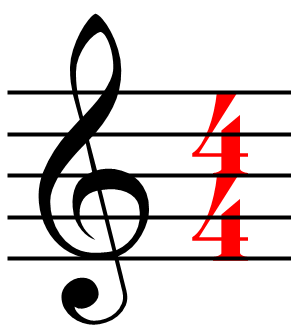 The bass clef has five lines and four spaces like the treble clef. The lines are G B D F A and the spaces are A C E G.
Recall the notes are whole notes. These notes are quarter notes and can be placed on a staff with the stems up or down. Name them without checking out the answers above. Draw a bass clef. Draw a treble clef. Place them on a staff–the thing with 5 lines and 4 spaces. 4. Review both Lessons 1 & 2. Keep at it, you are getting good. The next lesson will show you the notes that we have learned on a keyboard. With a keyboard or piano, discover where these notes are. Look closely at where the line or space each note is placed in both treble and bass clefs. Locate each of these notes on the piano or keyboard. These are called the “white keys” of the instrument. “F” is to the left of three black keys. “C” is to the left of two black keys. Find all “Fs” and “Cs” on the piano or keyboard. A meter signature is typically (with a few exceptions) two numbers, one sitting on top of the other. Each serves a specific purpose. There are many meter signatures. The one below is a 4/4 meter signature. What does it mean? The top number says there are 4 beats to each measure. The bottom number says: A quarter note gets one beat. Simply, a measure is the space on a staff between bar lines as the example below reveals. The example shows how 4/4 meter is counted rhythmically. Name the five notes by letter. Find them on your keyboard. Count the rhythm: Each quarter note gets one beat. The half note gets 2 beats. That means Play on “1” and hold on “2.” The whole notes gets 4 beats … play on “1” and hold on 2, 3 and 4. Play the notes in rhythm on you r keyboard. A 2/2 meter signatures means there are 2 beats to a measure and a half note gets one beat. The 6/8 and 9/8 meter signatures indicate an eighth note gets one beat. The top numbers indicate the number of beats in a measure: 3/4 = 3 beats to a measure; 2/4= 2 beats; 6/8 = 6 beats and 9/8= 9 beats. 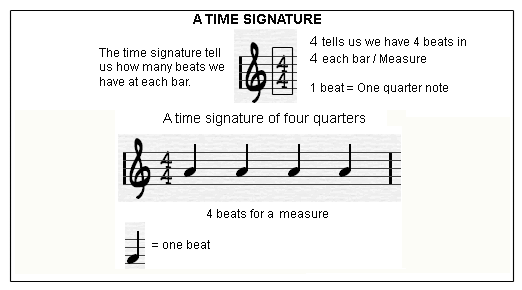 Clap and count the rhythms above according to the meter signatures. 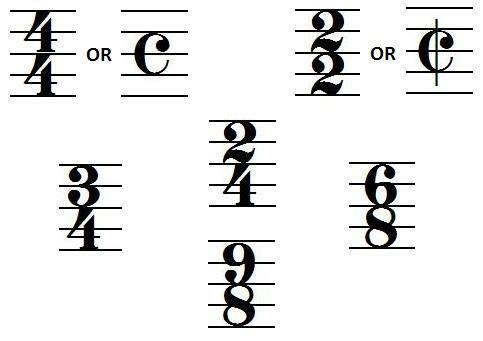 You may need assistance from someone who understands music theory. Review the information on notes to make this example clearer. A whole step includes 3 keys. It can be two white keys on a keyboard with a black key in the middle or 2 black keys with a white key in the middle. Examples of whole steps: C to D is a whole step. D to E is another whole step. F to G; G to A; and A to B.
G to A is a whole step. Half steps include 2 keys with no key in between. C to C# is a half step. B to Bb is a half step. E to F is also a half step involving two white keys. A sharp raises a note by one-half step. A flat lowers a note one-half step. A natural changes a sharp or a flat by one-half step returns it to its natural state. C to the black key (C#) above is called C sharp, and is a half step using white and black keys. D to the black key to the left of it is a half step (using the same black key) is Db. Find other on the key board.